Resounding on the rock-ribbed shore. On 14th–15th April 2011, the Department of Scandinavian Studies at the University of Tartu, Estonia, became the first official meeting place of the Austmarr Network, a network uniting scholars interested in comparative and interdisciplinary work in the field of pre-modern history and culture of the peoples living around the Baltic Sea. This research network was initiated by Professor Daniel Sävborg of the University of Tartu as a sub-group in the wider scholarly movement interested	in	the	re-actualization	of retrospective methods in the fields of history and culture studies, aiming to further their use in this particular regional context. These two days in Tartu brought together scholars from Finland, Sweden, Poland and Estonia, who had the opportunity to present ongoing research, discuss future plans for the network and – last but not least – to socialize and get to know each other better. The symposium was organized as a series of presentations lasting around twenty minutes each. The	presentations	covered	a considerable breadth of topics and were, without exception, followed by a lively discussion. Ülo Valk, Professor of Estonian and Comparative Folklore at the University of Tartu, gave a talk titled “Migratory Legends in Estonian Folklore, mostly focusing on folk legends and different classification systems. He discussed both different ways of distinguishing genres and types of tales in folklore. Frog, from the Department of Philosophy, History, Culture and Art Studies at the University of Helsinki, held a presentation on “Questions of Ethnocultural Substrata in the Finno-Karelian Song of Creation and the Sampo-Cycle", investigating the possibility that some forms of exchange from Germanic to Finno-Karelian culture could have taken place in the context of a larger mythological narrative tradition circulating in the Baltic Sea region. After the coffee break, the first day of the symposium	continued	with	Charlotte Hedenstierna-Jonson from the Museum of National Antiquities in Sweden, who presented her research project on identity, self-image and cultural expression in Viking Age Sweden called Birka, Rus ́ and Nordic Gentes. The project focuses on the inhabitants of Birka and was presented in Tartu under the title “Searching for Identities in Funerary Practices and Material Culture”. Professor Janne Saarikivi, from the Department of Finnish, Finno-Ugrian and Scandinavian Studies at the University of Helsinki, gave some “Remarks on the Denominations of the Pre-Christian Deities in Finnic Languages”, examining the problem of deity names and other pre-Christian religious terminology among the Finnic-speaking peoples. The first day was completed with two presentations focusing on more recent eras: Professor Leszek Słupecki, from the University of Rzeszów, gave an overview of the history and the present-day status of Old Norse Studies in Poland, and PhD student Mart Kuldkepp, from the Department of Scandinavian Studies, University of Tartu, discussed the reception of Old Norse Literature in Estonia. Even though the symposium programme was formally over for the first day, the evening continued with a longer guest lecture in Swedish for the students and academic staff of the Department of Scandinavian Studies by Maths Bertell, from the Department of Ethnology, History of Religions and Gender Studies at Stockholm University. The lecture was concerned with the question of similarities and differences between Scandinavian Þórr and the Estonian thunder god, especially in the context of the myth of the stolen thunder-weapon. The lecture was greatly appreciated by both the students and staff of the Department of Scandinavian Studies and the participants of the symposium. The second day began with a presentation by Tõnno Jonuks, Senior Researcher at the Estonian Literary Museum, on the image of Estonia in Old Norse literature, which was found to be two sided: Viking Age Estonia was apparently well-known to Scandinavians as a part of the same Baltic Sea region, but later came to be associated with monsters and magic. The day continued with Maths Bertell giving a talk on Þórr, Fjǫrgyn and their connection to Lithuanian Perkūnas. Daniel Sävborg gave a short presentation of his future research plans on Estonian folk traditions related to Viking and pre-Viking Scandinavia. Most of these traditions are certainly based on late, written sources of a learned tradition, but the development of such traditions is nevertheless interesting, and there could potentially also be folk traditions about medieval Scandinavia with actual medieval roots. This was followed by another coffee break, during which the participants of the symposium could read the fine poster presentation of the phenomenon of changelings in Estonian and Swedish folklore by PhD student Siiri Tomingas-Joandi of the Department of Scandinavian Studies, University of Tartu. The second day concluded with a roundtable discussion of future plans for the Austmarr Network. It was decided that the next meeting will be on the theme Transcultural Contacts in the Circum-Baltic Area Symposium and Workshop and take place in Helsinki, Finland, organized by Frog and Janne Saarikivi at the University of Helsinki. The meeting is tentatively scheduled to take place on 1st –2nd of June 2011, coordinated with the Sixth Nordic-Celtic-Baltic Folklore Symposium, Supernatural Places, to be held in Tartu, Estonia, June 4th–7th, 2012. The Austmarr meeting is planned to allow one day of travel from Helsinki to Tartu in order to facilitate the participants’ attendance at both meetings. The precise dates of the network meeting will be fixed in February when the schedule of the symposium in Tartu is finalized. 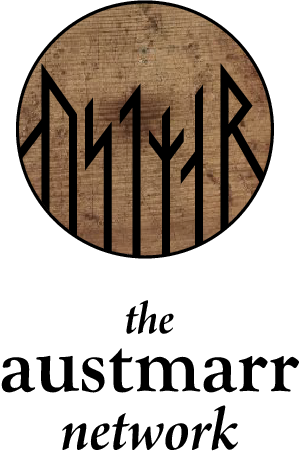 With the second meeting of the Austmarr Network, we hope to engage other scholars from the countries around the Baltic Sea, so that Russia, Latvia, Lithuania, Germany, Denmark and so forth will also be represented in future meetings. Amongst other things, this might open up the exciting possibility of hearing and comparing alternative perspectives on processes which affected the whole region, such as the crusades or the functioning of the Hanseatic League. Finnur Jónsson. 1912–1915. Den norsk-islandske skjaldedigtning B1. : Rettet tekst. København, Rosenkilde og Bagger. Samuel Laing. 1844. The Heimskringla or Chronicle of the Kings of Norway.Vol. 1. London, Longmans. Reproduced from RMN Newsletter 3: 43–44.